Mt. Diablo Resource Recovery offers a variety of sizes for carts, bins and boxes to fit your businesses needs. Please contact us if you would like to discuss options. Mt. 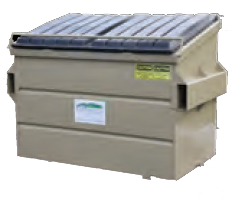 Diablo Resource Recovery provides a 96-gallon cart for your convenience. 20 cubic yards: 6.4′ H x 8′ W x 14′ L.
The State of California has implemented Mandatory Recycling Laws: AB 1826 and AB 341. These laws require businesses that generate a certain amount of waste to recycle. Mt. Diablo Resource Recovery is working hard to keep as many items as possible out of the landfill. This continues to be mission critical for both our residential and commercial accounts. Unfortunately, not all items can currently be recycled. When that happens we must dispose in the most efficient way possible. To help our commercial accounts set up garbage stations, we have included this handy resource. Stickers: Set up your receptacle area to include all of the items pictured here. 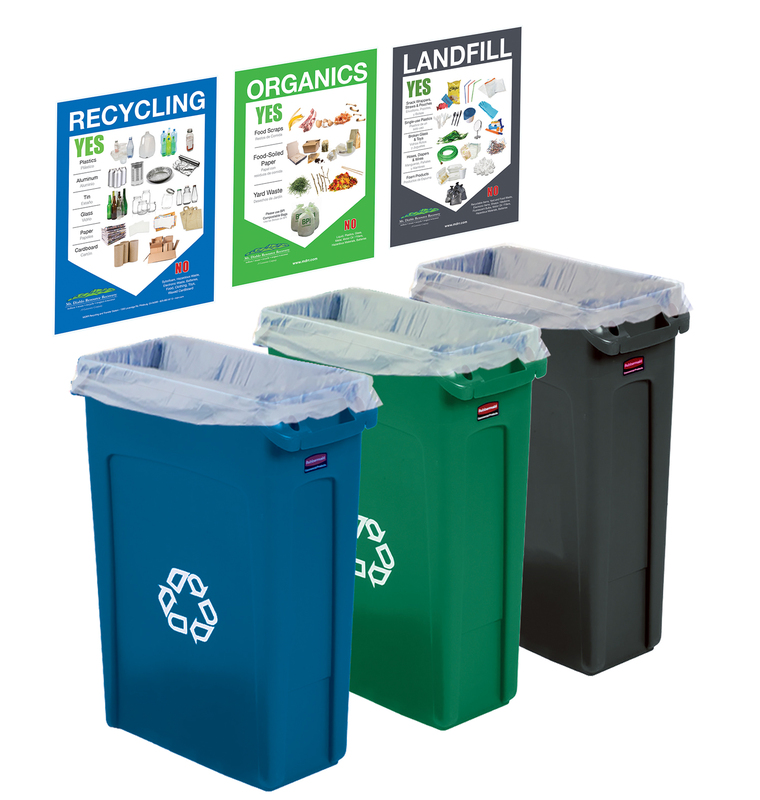 Encourage your employees and customers to recycle. The containers pictured, Rubbermaid Slim Jims, are not furnished by MDRR, however can be easily found online, or purchased from local home improvement stores. Thank you for working with us to keep items out of the landfill! The State of California has implemented a Mandatory Organics Recycling Laws: AB 1826. AB 1826 requires businesses that generate 4 cubic yards per week of organics to start an organics recycling program. Organics include food, yard trimmings, nonhazardous wood, and food soiled paper. Multi-Family complexes with 5 units or more must recycle yard waste. Yard waste include brush, flowers, grass, garden trimmings, tree trimmings, tree twigs & branches, weeds, wood chips and yard debris. Organic waste can be turned into energy and much more. Recycling organic waste diverts it from going into our landfill. Please help us divert these items. For more information on AB 1826, please download these flyers here or visit CalRecycle’s website. The State of California has implemented a Mandatory Recycling Laws: AB 341. AB 341 requires businesses that generate 4 cubic yards per week of garbage to start a recycling program. Recycling includes cardboard, clean paper, clean plastics #1-5 & #7, tin, aluminum and glass. It is essential that only CLEAN items go in the recycling containers. Any items that have liquid, food residue or is garbage will contaminate the entire recycling container. Please, only clean recycling. For more information on AB 341, please download these flyers here or visit CalRecycle’s website. 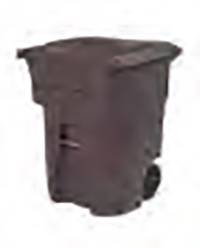 Bins & carts need to be accessible and ready for pick-up by 5 am on your service day. Garbage should not be loaded over the top of a cart/bin. The lid should be closed completely when the cart/bin is loaded. Large and bulky items should not be placed in your cart/bin. Please call our office to arrange a special pick-up for a fee. Access to bins and enclosures must be clear of debris and vehicles. There is an additional charge for return pick-ups. Locking devices are provided upon request. There is an additional charge for this service. No dirt, concrete or building material in the carts/bins.